VUORI glass mountains are sharp design objects handcrafted in Finland by glass artist Sini Majuri. Each snowy peak has it’s unique character created from mouth blown glass. Together they can be arrayed as an unique Arctic mountainous landscape that brings soul to the interior design. VUORI glass mountains can be used as glacial decoration objects and also custom interior installations. VUORI glass mountains will be presented in ILT interior lifestyle Tokyo fair in the Nordic Lifestyle-exhibition. Fair will be held 14 – 16.06.2017 and are open in the Tokyo Big Sight exhibition center. Glass Mountains have unique textures. The idea is that each have their own soul & character. Together they can be arrayed into mountainous landscape. Glass mountains will be exhibited in Interior Lifestyle Tokyo 2017 in Nordic Lifestyle exhibition in Scandinavian pavillion. ILT design fair is held in Tokyo Big Sight in June 14 – 16. I will participate in Dr Jekyll and Mrs Hyde, the main exhibition of the European Glass Festival in Wrocław 2016. Only 18 european glass artists are invited to the exhibition. It is great to be in this amazing event as the representative of Finland. The exhibition will be held in Wroclaw, The European Capital of Culture 2016 17.10.2016 – 10.11.2016. After this the exhibition will tour in Łódź (the City Art Gallery in Łódź), Legnica (the Art Gallery in Legnica); Jelenia Góra (the Karkonosze Museum, Krakow (the BB Gallery). The main idea behind my pieces is to create a sanctuary for broken minds. W znanej na całym świecie noweli szkockiego pisarza Roberta Louisa Stevensona “Strange Case of Dr Jekyll and Mr Hyde”, 1886, ceniony londyński lekarz dr Henry Jekyll zmienia się, pod wpływem zażycia wynalezionego przez siebie eliksiru, w okrutnego Edwarda Hyde‬’a. Jekyll, nie mogąc się pogodzić z czynami dokonywanymi przez siebie pod postacią Hyde‬’a, popełnia samobójstwo. Nowela Stevensona, określana jako portret psychopatologicznej podwójnej osobowości, wprowadziła na trwałe do potocznego języka frazę “Jekyll i Hyde” jako określenie osoby o rozdwojonej osobowości. Czy zamiana doktora Jekylla w panią Hyde zapobiegnie samobójstwu? Czy pani Hyde, podobnie jak pan Hyde, okaże się także potworem? A może będzie londyńską emancypantką, walczącą o prawa kobiet? Historia dr Jekylla nadal rozpala wyobraźnię czytelników opowieści Stevensona na całym świecie. Czy sprowokuje także artystów zaproszonych do udziału w głównej wystawie 5. edycji Europejskiego Festiwalu Szkła “Play with Glass” pt. “Mr Jekyll and Mrs Hyde” – do przedstawienia własnej wersji wydarzeń? Do zaprezentowania, przy wykorzystaniu szkła, opowieści o współczesnym dr Jekyllu, osamotnionym w industrialnej i wirtualnej przestrzeni XXI wieku? 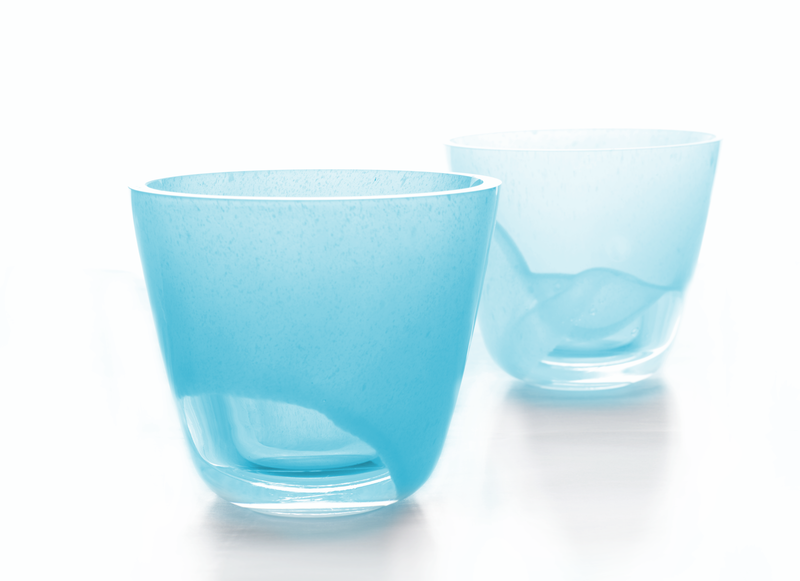 Vuoksi drinking glass and desert bowl captures the movement of a fluttering fabric inside the glass material. The bottom of the glass is transparent and it directs the light into the liquid inside. The combination of transparent and opaque flirts with light and shadow. Each glass has it’s own breath because the movement of the cloth-like colour is frozen inside the glass during the glass blowing process. Mold blown glass. Helsinki, Finland. Calm and silent arctic landscapes in glass. Polar Night- lamp is inspired by the surface of the snow and the atmosphere in the mountains of Lapland. The lamp has multiple nested glass domes that filter the light in various ways. Darker domes create soft light and a contrast to the white glass domes that shine brighter. The variation in the amount of light creates a throwback to Northern phenomenon, The Polar Night. The Polar Night occurs when the night lasts 24 hours. This happens only inside the polar circles. Even the sun stays under the horizon, it is never completely dark because the snow reflects the light that remains. When there is only a small amount of light it becomes valuable and sacred. In the year 2050 the technology engages more closely with living organisms, cells, plants and humans. Future lenses is an art installation that presents prototypes from this decade. Future Lenses is a contemporary glass art installation by Helsinki-based glass artist Sini Majuri. The project is a collaboration with Outotec OYj & Aalto University. The background of the installation is that glass is one of the important key technologies, from which the modern world has evolved. Eyeglasses, microscopes and telescopes have brought the development forward. Even the internet is basically made of glass. In 2050 we might have room for softer technologies that preserve our dreams and the nature for future generations. The lenses reflect three levels of time: past, present and future. The present moment is a white lens, which screens the the surrounding space transforming it into a dreamlike reflection. The black lens of the future shows the star chart from 2050. The transparent lens of the past perpetuate the annual rings of a tree. Natural light reveals the hidden rings of the glass material. These shadow rings draw up the possible futures that shift in the cycle of the sun. This lens is about future technologies that preserve the nature. Future lenses on kolmen suupuhelletun lasiesineen installaatio, joka tavoittelee vuoden 2050 olemusta sekä tulevaisuuden muotoilua. Linssit ovat prototyyppejä kyseisen vuosikymmenen esineistä. Veistosten taustalla on ajatus siitä, että lasi on yksi tärkeistä avainteknologioista, jolla nykymaailma on kehittynyt. Silmälasien, mikroskooppien ja teleskooppien linssit ovat vieneet ihmiskunnan kehitystä eteenpäin. Jopa internet on pohjimmiltaan lasia. Vuosi 2050 näyttäytyy aikana, jolloin ihminen matkustaa avaruuteen perustaen siirtokuntia Marsiin. Teknologia kytkeytyy yhä kiinteämmin eläviin organismeihin, soluihin, kasveihin ja ihmiseen. Ajassa on tilaa myös pehmeille teknologioille, jotka eivät vie ihmisiltä aikaa. Unet ja ajatukset on mahdollista kerätä talteen ja säilyttää tuleville polville. Esine, joka säilyttää ihmisen unia on henkilökohtainen. Se on linssi ihmisen mieleen. Future lenses kertoo myös tulevaisuuden tutkimuksesta ja ajasta. Installaatiossa on kolme ajan tasoa: menneisyys, nykyhetki ja tulevaisuus. Nykyhetki on valkoinen linssi, johon heijastuu unenomaisia heijastuksia ympäröivästä tilasta. Esine kuvastaa unien säilömistä. Tulevaisuuden linssiin on ikuistettu vuoden 2050 tähtikartta. Menneisyyden linssin lävitse tarkastellaan puun vuosirenkaita. Siihen on myös kätketty salaisuus. Luonnonvalossa lasin varjon vuosirenkaat piirtävät esiin mahdollisia tulevaisuuksia, jotka elävät vuorokauden valon mukaan. Future lenses on Outotecin ja Aalto-yliopiston tulevaisuuden tutkimuksen yhteisprojektissa syntynyt lasitaideteos. Teosten idea on rakentunut asiantuntijahaastattelujen sekä vuoden 2050 skenaarioiden pohjalta. Esineet on valmistettu suupuhalletusta lasista. Niiden koko on 40 cm x 40 cm x 25 cm. 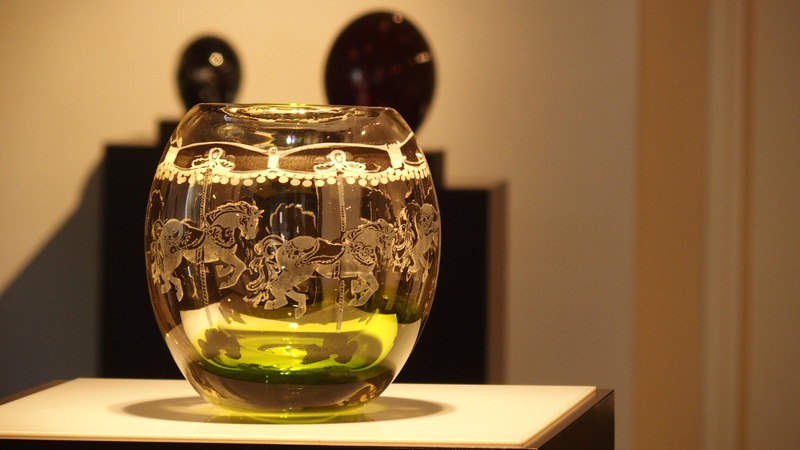 Sini Majuri is a glass artist from Finland. She combines 3D-design with old glass blowing techniques. 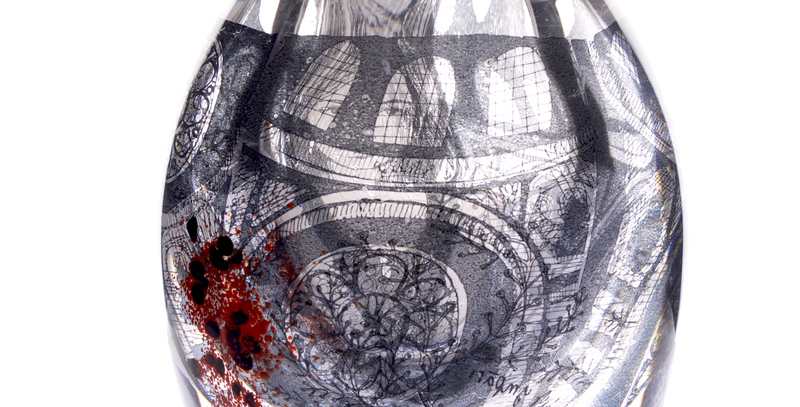 Many of her works are surrealistic stories captured inside blown glass. In 2016 Majuri represented Finland in European Glass Festival held in European Capital Of Culture 2016, Wroclaw. She has participated in approximately 30 exhibitions in Canada, China, Japan the Europe, and USA. 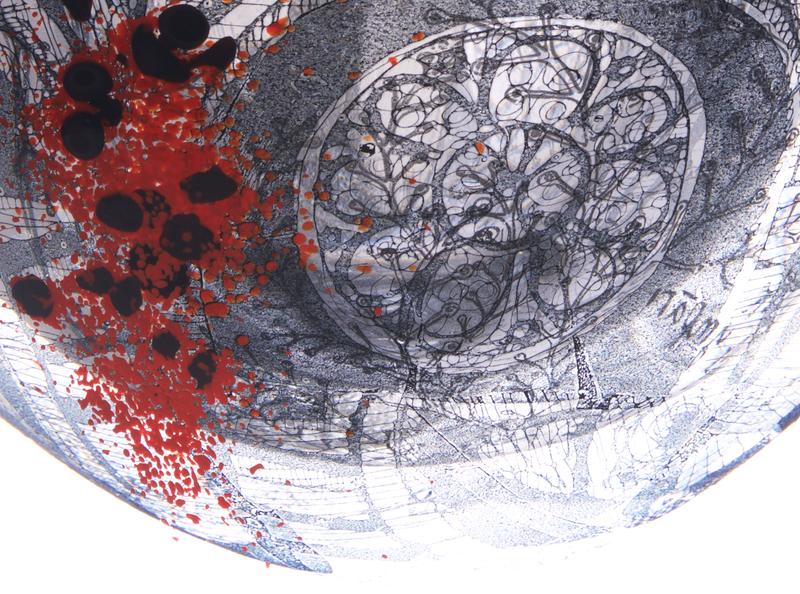 Majuri’s works have been published in many international contemporary art magazines, such as: Urban Glass, USA; Glass Art Magazine, USA; and Designboom, Italy. She has received a number of awards, including: Taos Glass Art – Taos Art Glass Invitational, New Mexico, USA, 2014; A-Design Awards, Venice, 2016 and Hempel Awards China Fashion Week. Her works can be found in public collections, including: the Finnish Glass Museum, Riihimäki; University of Helsinki, Helsinki; DAFA, New Mexico. She lives and works in Helsinki, Riihimäki and Suonenjoki. In my artistic work I’m aiming to capture dreamlike visions inside the glass. Mixing up the places, atmospheres and memories is how the dreams are build up. When the images are drowned inside the glass they will never change colour or fade away. They have the potential to last for thousands of years. Therefore I want to capture something valuable and beautiful inside the glass. As an artist I see myself as a storyteller. 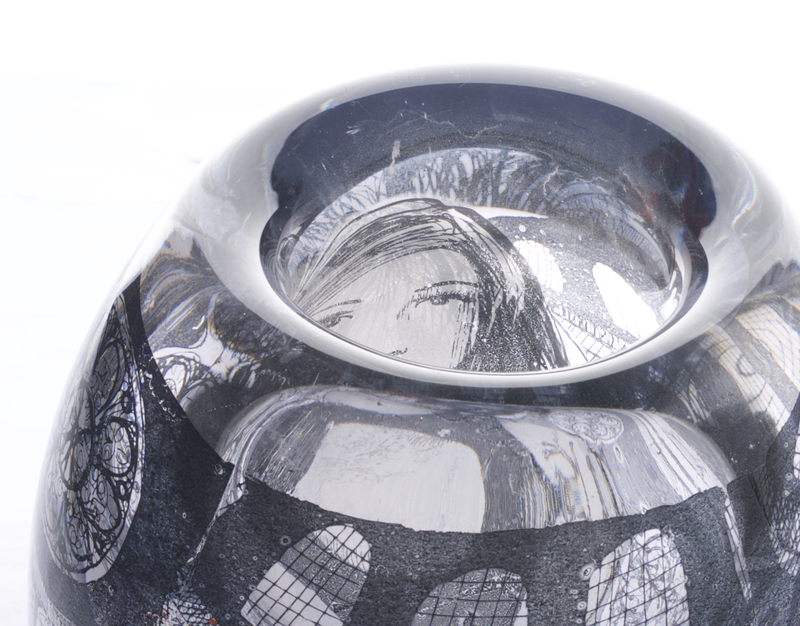 It’s my passion to bend the glass material in new ways to reflect something unseen. Lately I have been mixing up 100 years old techniques with 3D design. The reason why I’m working with glass is because it’s a rare and magical medium. It reflects the world around it, bends light and has interesting optic properties. When I’m blowing glass the material is alive until it is frozen into it’s final shape. In a way it is like a wild animal that you need to tame. The sense of magic that it has makes it a perfect medium for creating solid dreams. When I’m preparing an artwork I’m trying to catch a dream inside the glass. Many of my sculptures can be seen as cartoons or fairytales. The process is like a puzzle that starts from sketching the idea and collecting interesting details from the world around me. You also need to think three dimensionally and think how the different layers look when they are nested on top of each other. There are 3 to 6 image layers in my recent works and the most complicated ones can take a year to finish. As my creative process gained length, I have been getting closer to each creation. They have more hidden levels in them, such as messages and illustrations that can only be seen from the exact angle and in certain light. I hope that the works make the gaze wander, and get lost into the works. My most recent works are about a woman that realizes that she is dreaming and don’t want to wake up. Each sculpture is a scene from the story and together the pieces make a narrative that continues from sculpture to sculpture. Multiple image layers create surreal and dreamlike visuality in the works. The thick and heavy glass gives interesting optical properties to the dream scenes as the illustrations seem to move and distord as they are observed from different angles: Face of a woman looks sad when looked from above and angry when looked from behind. You can also see under and behind the image layers, there might be something hidden behind a window or deep into the woods in a thick forest. Teaching a 3D printing graal glass workshop in Ohio. Sini Majuri on Helsingissä, Riihimäellä ja Suonenjoella työskentelevä lasitaiteilija ja muotoilija. Hän on saanut lasitietoutensa Taideteollisesta korkeakoulusta. Majuri on palkittu kansainvälisissä nykytaiteen ja suunnittelun kilpailuissa Amerikassa ja Kiinassa. Vuonna 2016 Majuri osallistui Suomen edustajana European Glass Festival-näyttelyyn Euroopan kulttuuripääkaupungissa Wroclawissa. Vuonna 2014 hän edusti Suomea New Mexicossa pidetyssä kansainvälisessä nykylasitaiteen kilpailussa Taos Art Glass Invitationalissa. Hän osallistui myös Taos Glass Expoon vuonna 2015. Hänellä on ollut näyttelyitä esimerkiksi Lontoossa, New Yorkissa, Kanadassa ja Alankomaissa. Lasi on eläväinen materiaali, jonka muovaaminen on taikuutta. Kuuma lasi käyttäytyy kuin hehkuva laava tai juokseva hunaja. Se on pidettävä jatkuvassa liikkeessä, jotta se ei karkaa puhalluspillin päästä lattialle. Mielestäni lasin työstämisessä on jotakin runollista, koska sitä muotoillaan hengityksellä. Kun lasi on kesytetty haluttuun muotoon on sillä potentiaali säilyä ikuisesti tai särkyä hetkessä. Monet teoksistani ovat kertomuksia tai runoja lasin sisällä. Sarjakuvien piirtäminen on ollut minulle lapsuudesta saakka rakas taidemuoto. Se on kulkenut vierellä, kun olen työskennellyt muotikuvitusten parissa tai suunnitellut kattausesineitä. Olen myös vuosittain julkaissut sarjakuvateoksia. Sarjakuvan yhdistäminen uniikkiin lasiveistokseen on kiinnostanut minua kauan ja olen tämän yhdistelmän kautta halunnut löytää lasimuotoilulle uusia katsomisen ja kokemisen tasoja. Mielestäni kerronnallisuus tekee lasista sympaattista ja lasi kerronnallisuudesta tilallista. Lasin ominaisuuksista läpinäkyvyys, heijastukset sekä valon taitto ovat taiteessani tärkeitä. Käytän esineissäni usein graal-tekniikkaa, jolla kuvamaailmat saadaan suljetuksi lasin kerrosten sisään. Haluan taiteellisessa työssäni tarkastella vanhoja tekniikoita innovatiivisesta näkökulmasta ja soveltaa niitä raikkaalla tavalla. Uusimmissa teoksissani lasin sisään on luotu huoneita ja tiloja, joissa unimaailmat heijastuvat peilikuvina lasin sipulimaisiin kerroksiin. Taiteellisen luomisen prosessini alkaa usein ihastumisella. Työstän taukoamatta visuaalista narratiivia, joka tallentuu luonnoskirjani sivuille. Mutta sitten näen jotakin, mikä saa minut ihastumaan. Kenties vanhan karusellin tai hylätyn kaupungin. Tästä kohteesta tulee kertomukseni kiintopiste. Suljen karusellin lasiin, koska tiedän sen olevan jotakin säilyttämisen arvoista.